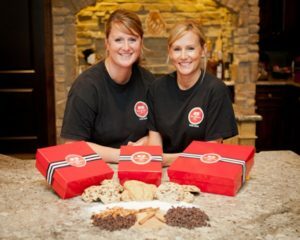 Sisters, Melissa and Ashley, of Sister 2 Sister Cookies recently renewed their lease at the Tyler Town Center so they’ll continue to bring Tylerites their sweet treats from a very central location. Agent, Blair Swaim of the BCP team has worked with the ladies since 2011 when they signed their first lease. In the years since, Blair and the property managers have worked with the sisters to ensure a pleasant working relationship. The drive thru is located at 322 ESE Loop 323, Tyler, TX 75703, next to the Cotton Patch Cafe. We appreciate their commitment to stay on in the Tyler Town Center and the entire team at Burns Commercial wishes them the absolute best for prosperity and continued success. When asked how the idea of Sister 2 Sister Cookies went from an idea to reality, Melissa stated “We had a family recipe for the Pecan Chocolate Chip cookie and was always a huge hit wherever we took them. Friends and family offered to buy them if we would sell them. We decided to take orders one holiday and it was a success. With lots of support from our husbands, we decided to open the drive thru for retail business in 2011”. The sisters hope to keep growing the business to those that haven’t tried their cookies yet. Their online ordering, complete with shipping, is a great way to share the sweet experience of Sister 2 Sister Cookies with your friends and family out of town. Do the sisters have a favorite cookie? Of course they do! Ashley’s favorite is the original Pecan Chocolate Chip while Melissa likes the creative side of baking and loves all of the seasonal cookies – Pumpkin, Cranberry Orange White Chocolate, Lemon, Red Velvet, Salted Caramel, etc.